Sponsored by Harrisons’ Pet Products. Does your bird get a messy beak during feeding time? Take a photo and you just might win some good stuff! 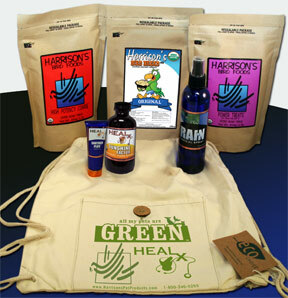 First prize is a Harrisons’ “Hollywood Goes Green” gift set that features an organic “All My Pets Are Green” backpack filled with Harrison’s Products. You must be a registered member of the Avian Avenue forums to participate. The Avian Avenue is an independent entity, run by bird lovers. Rio Can’t get Enough High Potency Fine! AMES, Iowa— Iowa State University’s College of Veterinary Medicine will be the beneficiary of the proceeds from the sale of the world’s number one and number two bestselling books on avian medicine. Iowa State alumni Greg and Linda Harrison are co-editors of “Avian Medicine: Principles and Application” and Greg co-edited “Clinical Avian Medicine.” Greg Harrison is a 1967 veterinary medicine graduate of Iowa State, while Linda Harrison graduated Iowa State in 1963 with a degree in home economics education. The South Palm Beach, Florida couple has purchased the remaining inventory of the two publications and donated the books along with the copyrights to the College of Veterinary Medicine. The total value of the gift is anticipated to be $650,000. Iowa State University Extension has created a dedicated Web site (https://www.extension.iastate.edu/store/ListItems.aspx?CategoryID=98) where the books may be purchased. All proceeds from the sales will benefit the College of Veterinary Medicine and the college’s avian and exotic animal medicine program. The Harrisons have also pledged a cash gift to further support this program. After graduating from Iowa State, the couple settled in Florida where Greg Harrison opened his own practice in Lake Worth in 1969. He gravitated toward aviculture and soon established The Bird Hospital, the first Florida practice exclusively for pet bird medicine and surgery before retiring in 2005. “Avian Medicine: Principles and Application” is a comprehensive text and practical guidebook for individuals involved in captive avian medicine and stewardship. “Clinical Avian Medicine” offers topics of concern to contemporary avian practitioners. This gift is part of Campaign Iowa State: With Pride and Purpose, the university’s $800 million fundraising effort. More than $735 million in gifts and future commitments for facilities and student, faculty and programmatic support have been made to Campaign Iowa State. Special thanks to Danita in Vancouver for filling us in on the progess of her very special African Grey Bea. Bea is roughly 23 years old. How long ago did you acquire her? I have had Bea for about 1 and one half years. I found a picture of her on the internet, posted by someone who wanted to rehome her. I was heartbroken just looking at it. The exchange of money for Bea took place at a Dairy Queen restaurant at the side of a highway. She was in a little carrier, holding so tight to her three eggs, and protecting them with all she had in her. What was her previous diet/health condition at that time? According to Bea’s vet, she was extremely debilitated, emotionally and physically. She was so weak, she had difficulty perching, and she was an excessive egg layer. The first week here, she ate and ate., She could not get enough food. Bea was also treated with medications for several infections. Her previous diet consisted of seeds and cat food. She is laying infertile eggs twice a year. She is so strong and healthy. I attribute her strength, feather condition and overall good health to her diet of Harrison’s mash. She looks forward to it twice a day. Bea also enjoys fresh foods. In the time that Bea has been here, she has become the senior flock member (we have another grey and a macaw). They both know that Bea means business when they come near her. Bea is very affectionate with our family. She enjoys cuddling and lots of interaction. There is something in her eyes that is hard to describe, when she looks at me I melt every time. Bea is one of those pets that you bond with so tightly, and that only comes to you once in a lifetime. I am so thankful I was able to give her a forever home where she will always be treasured and cared for. “She was a Peanut/Cat food/ and Seed girl when I got her. I wanted her to eat Harrisons, so I started with mostly warm mashed banana, then added the mash slowly. Eventually it increased to all mash and no banana. My three large birds eat this 1-2 times a day. WINNER ANNOUNCED! Vittorio Capello, DVM, Dipl ECZM (Small Mammal) Wins Harrisons’ Pet Products’ 2009 Clinical Case Report Contest. HBD products were spotted in the recently released movie Everybody Wants To Be Italian. Our stuff (Harrison’s Bird Foods, AVIx and ZEN products and promotional materials) appears no less than a dozen times in the film. Central character Jay Jablonski (Jake Bianski) brings a sick pet to Dr. Marisa Costa’s (Cerina Vincent) veterinary clinic. At that point various HBD items appear in the background throughout the clinic. The movie was released on DVD in early 2009 Check it out and let us know what you see!